What a difference a few months can make, especially at a football club. Newcastle United fans endured a turbulent pre-season, as they saw the heart and soul of their team leaving for pastures new with Kevin Nolan and Joey Barton making their way to London and José Enrique joining his former colleague Andy Carroll at Liverpool. 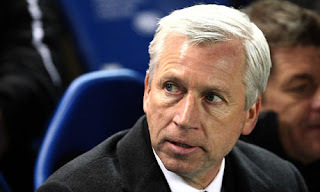 The departing players wasted little time in putting the boot into their former club, which might be expected, but this exodus did seem to undermine the authority of manager Alan Pardew, who had firmly stated that they would all stay. Pardew himself still had a lot to prove to the Geordie faithful, as his track record at former clubs had provided little support for his abundant self-confidence. Above all, the rotund figure of Mike Ashley loomed large in the background with his almost unparalleled ability to alienate supporters with a series of embarrassing gaffes and his seeming unwillingness to hand Pardew much of the £35 million received for Carroll. That was then, this is now. The Toon army has had much to celebrate in a season that has seen their team restore the pride in the shirt. Playing some thoughtful, attractive football, Newcastle currently lie sixth in the Premier League with a genuine chance of qualifying for Europe. "Pardew - Fade to Grey"
Pardew’s appointment now appears remarkably astute, even though there is still much sympathy for his unfortunate predecessor, Chris Hughton, while there is an increasing belief that selling some of the club’s more experienced players has strengthened the harmony in the dressing room and actually helped to improve the team’s style. In truth, Newcastle have been on the road to recovery ever since they secured promotion from the Championship two years ago, when they bounced back after just one season in the lower tier. There is little doubt that Ashley played a major part in Newcastle’s relegation after 16 consecutive seasons in the top flight, even though the club enjoyed one of the highest budgets in the Premier League, as he was responsible for a series of frankly baffling managerial appointments, starting with the overly sentimental choice of Kevin Keegan, followed by Joe Kinnear, who had been out of the game for four years, and culminating in local hero, Alan Shearer, who won only once in eight games after leaping off the Match of the Day sofa. However, he was also the man who bankrolled the largest wage bill in the Championship, despite the club’s revenue nearly halving. Although many players left during the summer of 2009, the club retained the vast proportion of its squad and strengthened it further in the January 2010 transfer window. So, although Newcastle’s demotion had largely been a mess caused by Ashley, at least he helped to clear it up, as his willingness to fund a Premier League wage bill in the Championship clearly gave the club the best chance of being promoted. Ashley is known as a man who likes a bet and in this case his gamble paid off. 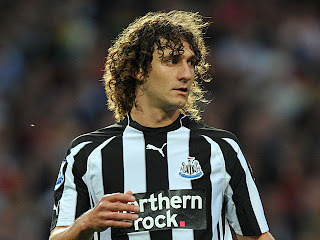 "Coloccini - Songs from the big hair"
Since Ashley bought the club in June 2007, Newcastle supporters have become all too aware of the owner’s habit of shooting himself in the foot. Even his right-hand man Llambias admitted, “We were naïve and we made mistakes.” Ashley’s initial attempts to ingratiate himself with the fans by stuffing himself into a replica shirt came across as cringe-inducing, rather than endearing, while his recruitment of the “Cockney mafia”, including the taxi drivers’ friend Dennis Wise, angered people, not so much because of their origins, but the fact that they had virtually no experience of running a football club. Other less than brilliant ideas included putting the club up for sale on its website, inviting bidders to send applications to an e-mail address (yes, really), and deciding to rename the splendid St. James’ Park the Sports Direct Arena, after Ashley’s own cheap and nasty retail chain. Although things got worse before they got better, it could be argued that relegation was the slap in the face that Newcastle needed for them to get to grips with their myriad issues off the pitch. Not only did their stint in the Championship boost the club’s morale, as the team once again acquired the winning habit, but more importantly it forced the club to address its financial problems – and also lowered expectations to a more reasonable level. Indeed, last season’s twelfth place in the Premier League, followed by this season’s improvement, represents the sort of steady progress that is just what a company doctor would have ordered. This is all the more impressive, as it has been achieved within a sensible budget, so that the club’s finances now look a great deal healthier. Years of hefty losses have been converted into a substantial profit, while the wage bill has been slashed and debt is under control. To paraphrase the Rolling Stones, Ashley saw a club’s balance sheet covered in red ink and painted it black. The club clearly outlined its self-financing strategy when it published a mission statement that talked of no longer financing losses by increasing debt year after year. It referenced a “five-year plan to get Newcastle United on a sound financial footing”, which by and large they have succeeded in doing, though presumably relegation was not part of the original strategy. Moreover, this has to be managed within budget, as Llambias explained, “We have to recruit what we can afford.” This is a laudable objective, but will only succeed if the club has a good scouting network. 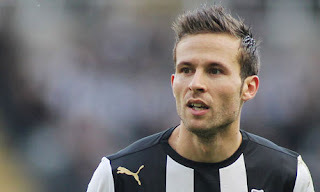 Fortunately, under the auspices of chief scout Graham Carr, this seems to be the case, as they have made a number of shrewd purchases for relatively modest fees, doing particularly well in the French market, where their bargain signings include the dynamic central midfield partnership of Cheick Tioté and Yohan Cabaye. These players have arrived with a point to prove and appear to be hungrier than their high-earning predecessors. Such a policy of doing business “on the cheap” does not necessarily mean a reduction in quality. 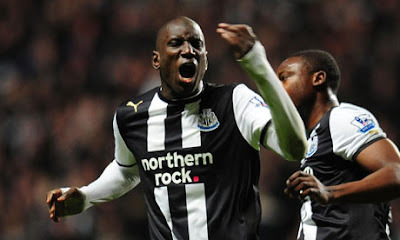 The best example is probably Senegalese striker Demba Ba, who has scored an impressive 16 goals since he arrived on a free transfer in the summer. Not bad, especially considering that he cost £35 million less than Andy Carroll, the man he effectively replaced. This is very different from the previous regime urging the “Geordie nation” forward, while they risked the club’s future. As the great Elvis Costello once said, “Clowntime is over.” For so long the poster boy of inept mismanagement, Newcastle United are now a great example of how you don’t have to break the bank to be successful. 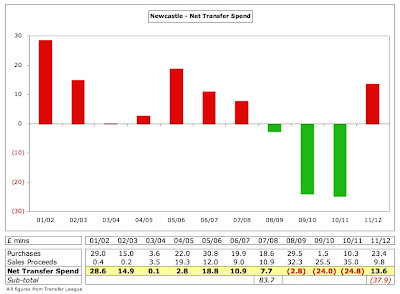 So Newcastle have made great strides financially, but how has this happened and what does it mean exactly? Let’s take a look at the key questions arising from their journey. 1. How profitable is the club? 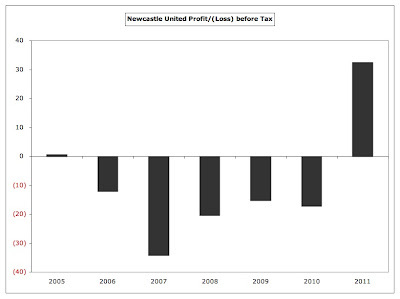 After many years of hefty losses, Newcastle reported an impressive £32.6 million profit before tax in 2010/11, compared to a loss of £17.1 million the previous season, which represents an improvement of nearly £50 million year-on-year. Within that figure, the operating loss was significantly reduced from £33.5 million to just £3.9 million, a huge turnaround. This comprised a cash profit (or EBITDA – Earnings Before Interest, Taxation, Depreciation and Amortisation) of £16.2 million less £20.1 million of non-cash flow expenses (player amortisation £13.5 million, impairment of player values £3.7 million and depreciation £2.9 million). Revenue grew by £36 million (69%), while costs only increased slightly by £1.2 million (2%), as the £6 million rise in the wage bill to £54 million was largely covered by a £5 million reduction in other expenses. The bottom line was then boosted by a substantial profit on player sales of £37 million, £21 million higher than the previous season, mainly due to Carroll’s barely credible £35 million transfer to Liverpool. To place this achievement into context, the last time that Newcastle made a profit was back in 2005 – and that was a very small one of £0.6 million. In the following five years, the club made combined losses of around £100 million: 2006 £12 million, 2007 £34 million, 2008 £20 million in 2008, 2009 £15 million and 2010 £17 million. In other words, Newcastle had been very obviously living beyond their means. In fairness, last season’s loss in the Championship actually showed the first signs of improvement, as it was around the same level as the deficit in the Premier League, despite a massive (£34 million) drop in revenue, thanks to the determined actions the club took with their wage bill. 2. Are they self-financing yet? Although the overall profit of £32.6 million is a notable performance, it is evident that this is largely due to the sale of Carroll. Excluding the £36.7 million profit on player sales, the club would have made a loss of £4.1 million. Newcastle’s reliance on player sales is nothing new, as they have made £86 million profits from this activity in the last four years, including £10.8 million in 2008 (mainly Kieron Dyer), £23.4 million in 2009 (James Milner, Shay Given, Charles N’Zogbia and Emre) and £15.4 million in 2010 (Sebastien Bassong, Obafemi Martins and Damien Duff). This is very different to previous years when profit on player sales was nowhere near enough to cover large operating losses. In the four years up to 2010, the annual “clean” loss (excluding player sales and exceptional items) was between £27 million to £35 million, which was a recipe for disaster. By far the largest reason for these exceptional charges was the severance payments made to departing managers, including Graeme Souness, Glenn Roeder, Sam Allardyce and Keegan, which amounted to a staggering £14 million between 2006 and 2009. Not only did this hire-and-fire policy disrupt the club on the pitch, but it also damaged it financially. It should also be noted that the £34.2 million loss in 2007 (the last financial year of the old board) would have been even higher without the benefit of £6.7 million of compensation received following Michael Owen’s injury at the 2006 World Cup. Otherwise, it would have been a shocking £41 million, including a £2 million loss on player sales. 3. How does the profit compare to other clubs? If another statistic were needed to emphasise how well Newcastle are doing financially, try this for size: they made more money than any other club in the Premier League last season with their profit of £32.6 million. This was ahead of the cash machine known as Manchester United (£30 million), the low spending Blackpool (£21 million) and the widely admired Arsenal (£15 million). 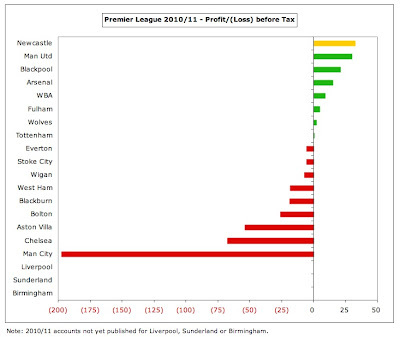 Three clubs (Liverpool, Sunderland and Birmingham City) have still to publish their accounts for 2010/11, but there is no chance of them emulating Newcastle’s performance. Although more clubs were profitable last season (eight of the 17 to report in 2010/11, as opposed to four out of 20 in 2009/10), Newcastle’s figures are particularly impressive if you consider that Aston Villa, a club with similar aspirations, made a gigantic loss of £54 million last season. 4. What difference has Ashley really made to the club’s profit? Before we go overboard about the impact Ashley has made on the club’s business, it is worth making a comparison to the situation before he arrived. On first glance, this looks like an amazing transformation, as he has converted the 2007 loss of £34.2 million to a thumping great profit of £32.6 million, delivering an improvement of around £67 million. Not bad at all, but this is mainly due to two factors: (a) profit on player sales is £39 million higher; (b) he has cut costs by £27 million after reducing operating expenses by £12 million, player amortisation (including impairment) by £9 million and interest payable by £6 million. This is all highly laudable, but what he has not managed to do is to grow revenue. In fact, the 2011 revenue of £88.5 million is only £1.4 million (2%) higher than the £87.1 million generated in 2007, despite the higher Premier League TV deal. Both match day and commercial revenue have declined, the former partly due to 2007 being boosted by a good run in the UEFA Cup. In fairness, much of the fall in commercial income was due to outsourcing the club’s catering operations in 2009, which also lowered costs, but the underlying performance is still not that good – it was described as “relatively flat” last season. 5. But didn’t the revenue grow substantially last season? It is true that revenue grew by almost 70% in 2010/11 from £52.4 million to £88.5 million, but this was almost entirely due to promotion to the Premier League, where TV revenue is significantly higher than the Championship (even with parachute payments). 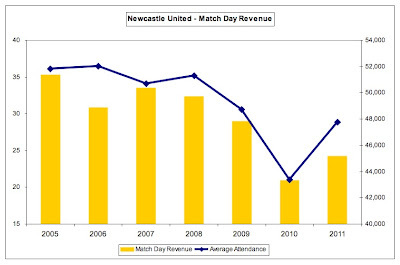 In other words, this only meant a return to much the same level of revenue as 2008/09, the last season in the top flight, when Newcastle earned £86.1 million. 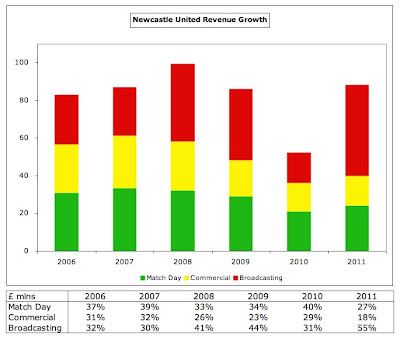 Newcastle have become increasingly reliant on TV revenue, which has risen from 30% of total turnover in 2007 to 55% in 2011. 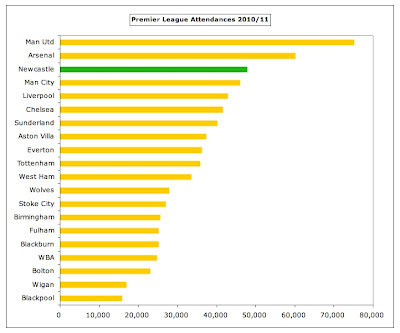 This might sound like it’s on the high side, but most other clubs in the Premier League are even more dependant, e.g. Blackburn Rovers and Bolton Wanderers earn about three-quarters of their money from TV, while an astonishing 88% of Wigan Athletic’s revenue comes from this source. 6. 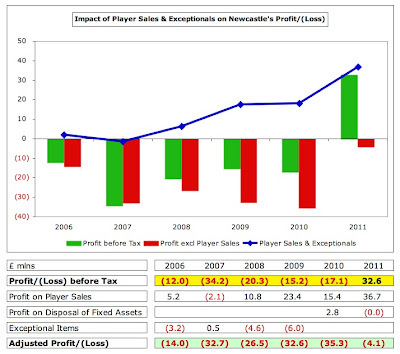 So is Newcastle’s revenue good or bad? 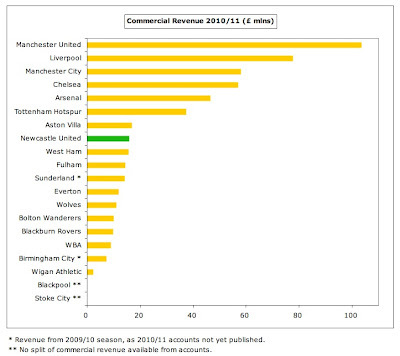 On the one hand, Newcastle have little to complain about, as they enjoy the eighth highest revenue in England, around the same level as Aston Villa. In fact, their turnover of £88.5 million is actually the 25th largest in Europe, just ahead of clubs like Ajax and VfB Stuttgart. On the other hand, they are still a long way behind the six leading English clubs. This season’s thrilling 3-0 victory against Manchester United is all the more impressive when you consider that the Reds earn almost four times as much with £331 million. Similarly, Arsenal (£227 million) and Chelsea (£226 million) have around £140 million more than Newcastle, while Tottenham (£164 million) and Manchester City (£153 million) generate nearly twice as much. The fact that the traditional “Sky Four” are so far ahead in terms of revenue may not be too surprising, but it is concerning that there is such a big gap to Spurs and City, especially as they have been rapidly growing their revenue, while Newcastle have effectively been running to stand still. For example, in 2007 Newcastle’s revenue of £87 million was only £16 million less than Spurs, but they are now £75 million behind. 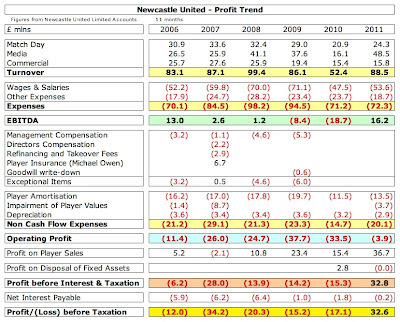 The Geordies were actually £30 million ahead of City in 2007, compared to the current £65 million deficit. 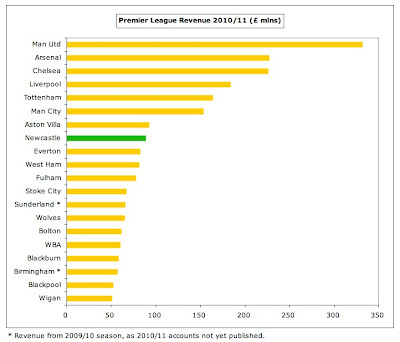 For Newcastle to still be competitive at the upper levels of the Premier League with a much smaller budget is worth of admiration, but it will make it hard to repeat this feat on a consistent basis, unless they can somehow grow their revenue. As Pardew explained, “The problem is that where we are financially means it's hard to fulfil the expectations of fans who a few years ago watched European football here.” That said, their resources should be sufficient to keep them in the top ten. 7. What are the implications of finishing higher in the Premier League? 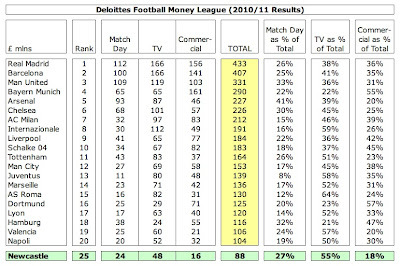 The distribution methodology for TV revenue in the Premier League is fairly equitable, so there would not be an enormous difference if Newcastle climbed up the table, though the additional money would still be worthwhile. The lion’s share of the money is allocated equally to each club, which means 50% of the domestic rights (£13.8 million in 2010/11) and 100% of the overseas rights (£17.9 million). However, merit payments (25% of domestic rights) are worth £757,000 per place in the league table, so if Newcastle were to finish in their current sixth position, i.e. six places higher than last season, that would give them £4.8 million additional revenue. Finally, facility fees (25% of domestic rights) depend on how many times each club is broadcast live, which has traditionally benefited Newcastle, as the “great entertainers” tag lives on, so they were shown 16 times last season, the seventh highest in the division. This helped them to receive more TV money than two of the clubs that finished above them (Sunderland and WBA), while they earned nearly £3 million more from facility fees than eighth placed Fulham (£8.7 million vs. £5.8 million). Total television revenue of £48.5 million was £32.4 million higher than the £16.1 million received in the Championship, which largely comprised a £12 million parachute payment, £2.5 million central distribution and a £1 million solidarity payment. This huge disparity demonstrates how important it was for Newcastle to get back to the top flight, not least because they will be hoping that the next three-year Premier League deal will again rise, as it did in 2007/08 and 2010/11, while the forthcoming Football League deal is for less money than before. 8. What would happen if Newcastle qualified for the Champions League? The Europa League would provide some extra cash, but it pales into insignificance compared to the riches available in the Champions League, as can be seen by Liverpool and Manchester City only earning £5 million apiece in return for reaching the last 16, though it would mean additional gate receipts. 9. How important is the Toon Army to Newcastle’s finances? However, the crowds have fallen from their peak, when they regularly averaged over 50,000. The decline first started in the relegation season and accelerated in the Championship, though they have improved since promotion. 10. What does this mean for match day revenue? 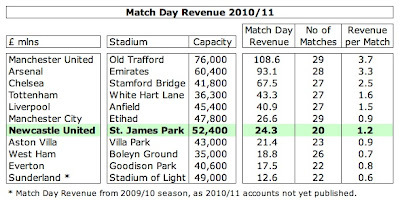 Although match day revenue increased from £20.9 million to £24.3 million following promotion, this has still fallen significantly from the peak of £35.3 million in 2005, partly due to the reduction in attendances, but also due to fewer home matches, e.g. in 2010/11 Newcastle staged only 20 games (19 Premier League and 1 Carling Cup), while there were 30 in 2004/05 (including 3 FA Cup, 2 Carling Cup and 6 UEFA Cup). As a result of what the club described as “stadium utilisation of only 91%”, they have initiated a number of ticket initiatives in an attempt to fill the ground, such as freezing the price of season tickets for 10 years (if bought now); allowing payment in 12 monthly instalments for the first time; increasing the size of the family enclosure to 7,500 (the largest in the Premier League); introducing a new section for supporters aged between 18 and 21 to ease the transition to full adult pricing; and offering half-price season tickets in October. In addition, the prices of corporate boxes have been held level, as this category has been weak in recent years, falling from £6.7 million to £2.8 million after relegation and only climbing back to £4.2 million following promotion. In fairness, Newcastle’s match day revenue is still the seventh best in England, but it is a long way behind Manchester United £109 million, Arsenal £93 million, Chelsea £68 million, Tottenham £43 million and Liverpool £41 million. 11. Why is Ashley so keen on stadium naming rights? Newcastle’s commercial revenue of £15.8 million may be the eighth highest in the Premier League, but it is still low for a club of Newcastle’s size and history. Any comparison with the likes of Manchester United £103 million and Liverpool £77 million may be somewhat spurious, but they should still be closer to Tottenham’s £37 million. Nevertheless, they have had some success here. In January Virgin Money took over the shirt sponsorship from Northern Rock until the end of the 2013/14 season. Although financial details were not divulged, it is very likely that this is worth more, as Northern Rock’s extended deal was worth only £2.5 million per annum (about half of the previous contract of £4.8 million), while some sections of the press announced that the Virgin agreement was worth up to £20 million in total, which would imply around £10 million a year. This seems on the high side, though Aston Villa have recently signed a new sponsor at £8 million. It has also been reported that Ashley has negotiated a “significant rise in revenue” for the two-year extension of the Puma kit deal until 2014. In any case, these deals are still far below the leading shirt sponsorships with £20 million being earned by Liverpool from Standard Chartered, Manchester United from Aon and (reportedly) Manchester City from Etihad. A legitimate objective might be to emulate Tottenham’s £12.5 million (£10 million Auresma plus £2.5 million Investec). It’s a similar story with kit suppliers, as seen by the £25 million deals for Liverpool with Warrior Sports and Manchester United with Nike. You might expect Newcastle to earn a great deal from the sale of replica shirts, but Llambias advised that the club’s retail turnover was only £5 million, producing a miniscule profit of £100-200,000. That’s all well and good, but Ashley has gone about this in a strange fashion, temporarily renaming the stadium the Sports Direct Arena in a clumsy attempt to “showcase the opportunity to interested parties.” Apart from giving his company some free, albeit negative, publicity, there seems to be little logic behind this decision, as it does not bring in any additional revenue. The only rationale that might conceivably make sense is that any future bidder might be looked upon more fondly after replacing the much maligned retail chain as sponsor. That said, the club’s hope of securing £8-10 million a year looks optimistic, as naming rights are far less effective with existing stadiums and other clubs like Chelsea have struggled to attract sponsors at this level. 12. How have they managed to cut costs? The club has cut costs across the board, but has been particularly effective at reducing the wage bill by £17 million from £71 million in 2009 to £54 million in 2011. It did rise £6 million from last season’s £48 million, but this was to be expected following promotion from the Championship, especially as the headcount increased by 47 from 431 to 478 (20 in players and coaching staff, 24 in administration). Llambias said that the club had “worked hard to address an inherited wages to turnover ratio which was unsustainable.” This was 83% in 2009, rising to 91% in the Championship, but is now down to a comfortable 61%. 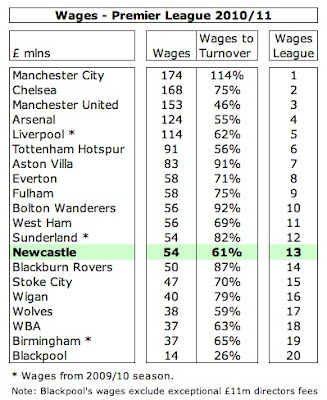 In fact, Newcastle’s wage bill of £54 million is only the 13th largest in the Premier League, so they have done much better than the figures would suggest this season, give the strong correlation between budget and playing success. This is in stark contrast to 2009, when Newcastle were relegated with the sixth highest wage bill, so massively under-performed. 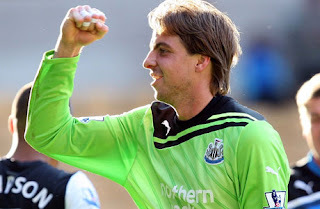 Although new signings and contract extensions like those signed by Tioté, captain Fabricio Coloccini and goalkeeper Tim Krul will put pressure on the wage bill, it is also true that some high earners (Barton, Nolan and Enrique) have left since these accounts closed. Interestingly, it has been revealed that the club has settled a dispute over image rights with HMRC, apparently for less than the amount set aside as a contingency. Similar to wages, player amortisation, namely the annual expense of writing down the purchase price of new players, is £6 million lower than the last time the club were in the top flight at £14 million. It did increase by £2 million in 2011, but is nowhere near as much as big spenders like Manchester City £84 million and Chelsea £40 million. In fact, it’s about the same level as lowly Wigan Athletic. 13. Have Newcastle become a selling club? Traditionally, the club has spent big on new players, but that has pretty much changed since Ashley’s arrival with three consecutive years of net sales proceeds, though this season has been a little different with net spend of £13.6 million. 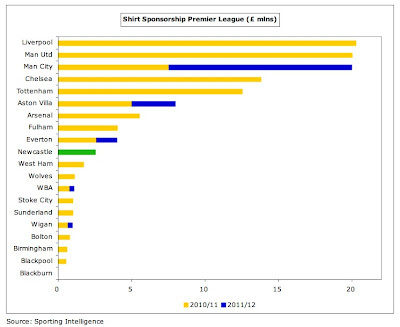 Nevertheless, nobody can accuse Newcastle of buying success. 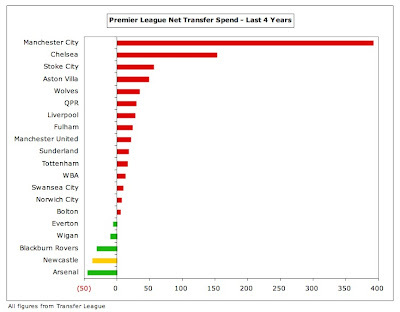 Indeed, only Arsenal have a lower net transfer spend over the last four seasons with Newcastle generating proceeds of £38 million. Put another way, they have balanced their books in this period and then had the unexpected bonus of the Carroll sale. Llambias admitted, “We’re not saying we are not a selling club. The reality is when we get the price in, we have to sell our best players.” That might not be a message that the fans want to hear, but it is profoundly realistic. 14. Is the club’s debt manageable? Net debt fell last season from £150 million to £130 million, comprising a £140 million loan from Mike Ashley less £10 million cash balances. 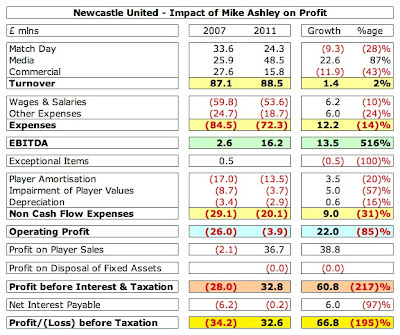 Since Ashley arrived, the gross debt has significantly increased from £77 million in 2007, though he also had to clear the mortgage on the ground. Importantly, the club now has no external debt (it had a £36 million overdraft as recently as 2009), which not only provides more stability, but has also saved considerable sums in interest payments. These were £6.5 million in 2007, but would now be around £11 million a year following the rise in debt. Although Newcastle’s annual report initially stated that Ashley’s loans would carry interest at LIBOR + 0.5%, since 2009 they have all been classified as non-interest bearing. The 2010 accounts said that £12.3 million was repayable in August 2010, £16.5 million after more than a year and the remainder on demand, but no repayments have actually been made to date – though it is likely Ashley will want the loans repaid at some stage. 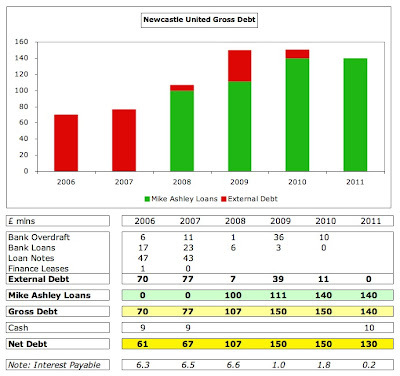 The previous ownership had mortgaged Newcastle to the hilt, securing loans on virtually all the club’s assets (training ground) and future income streams (TV, sponsorship), and also left Ashley with deferred transfer payments of £36 million, some of which was owed on players who had left the club. Following the implementation of a new policy whereby transfers fees are paid up front, the club is now owed £5 million. Even so, the balance sheet shows net liabilities of £36 million, though the players’ values in the accounts of £32 million is under-stated compared to the price they would receive in the real world (estimated at £120 million). 15. How important has Ashley been to Newcastle’s revival off the pitch? 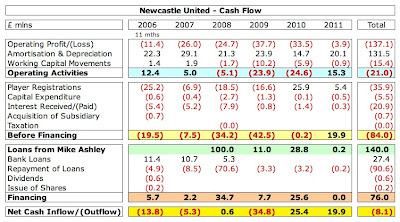 Despite his occasional crass behaviour, there is no doubt that Mike Ashley has put his hand in his pocket to keep the club going, as its cash flow has been consistently negative before his financing. There is still much distrust of the owner, leading Llambias to emphasise in the results statement, “Once again, Mike has not taken any money out of the club.” In fact, he has invested £273 million in total, made up of £133 million to acquire Newcastle plus £140 million of loans. Some might argue that this is partly his own fault, as he clearly failed to perform adequate due diligence on the books before buying the club. However, Newcastle’s improvement off the pitch can be seen by the fact that Ashley only had to advance a further £0.2 million last season. 16. Will Ashley sell the club? He is certainly under no immediate financial pressure to sell, as his net worth rose £400 million last year to £1.6 billion, according to Forbes wealth magazine. That said, it is clear that the club is now a far more attractive prospect to potential investors, as it is more financially stable and challenging for European qualification. 17. Will Newcastle be affected by UEFA Financial Fair Play? If the club qualifies for Europe, then it will have to live within its own means, though it will be allowed to make losses up to a certain level, so long as the deficit is covered by the owner, e.g. €45 million (£38 million) for the two years leading up to the first monitoring period in 2013/14. Newcastle’s mission statement explicitly mentions that they are “working towards being able to operate within the boundaries of UEFA’s FFP.” This would be no problem if they repeat last season’s financial performance, especially as certain costs can be excluded for the FFP calculation such as depreciation on fixed assets and expenditure on youth development. 18. What does the future hold? The club is reportedly looking to make profits of £10 million a year, which could be possible if they can continue to control their wage bill. The opportunities for revenue growth are limited, given that the TV deal is centrally controlled, while ticket prices have been largely frozen. That only leaves more money from success on the pitch, such as finishing higher in the league or European qualification, or from commercial activities, such as new sponsorship deals. As well as looking to maintain their “efficiency” in the transfer market, Newcastle will focus on their academy, which has recently produced promising talents like Sammy Ameobi and Shane Ferguson. The aim is to secure Category One status under the Premier League’s new Elite Player Performance Plan (EPPP), which would mean they could recruit youngsters from anywhere within the country rather than the current restriction of 90 minutes from the academy. "Cissé - Papiss don't preach"
Backed by their large, passionate following, Newcastle United should really have a bright outlook. If they continue to improve on the pitch, that might result in a virtuous circle, as that should generate more money, leading to better players arriving, thus increasing the chances of success. Another first class analysis. These figures only go to show how important it is for clubs such as Newcastle to develop sophisticated transfer strategies in order to minimise disparities in commercial and match day income between themselves and other top Premiership clubs. However they beg the question as to whether such strategies are sustainable in the long term, given that this is a model which other Premiership clubs will surely follow – Sunderland and Aston Villa being obvious examples. It only takes a few bad decisions in the transfer market or a poor managerial appointment for the strategy to go awry. 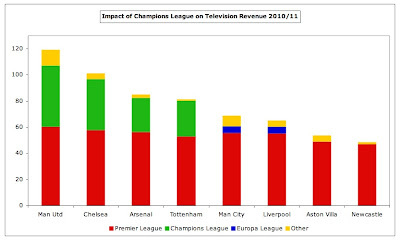 All in all the success of the Premiership as a brand stems from the redistributive effect of its TV deal, which transfers money from the richest to the poorest clubs thus strengthening competition within the league – a good example of how revenue sharing within sport promotes rather than inhibits competition. 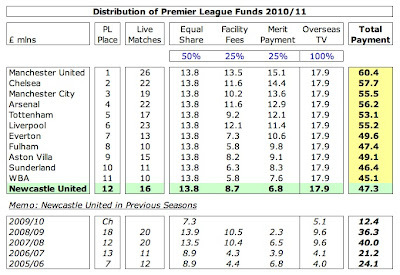 Without their TV income Newcastle wouldn’t be on the same financial planet as clubs like Man Utd. So, whisper it, and don’t put this to the Premiership chairmen, but who would have thought that, in 2012, you’d see socialist principles alive and well in English football? I doff my Trilby to you sir.As always,a great piece on my beloved NUFC.Onwards and upwards!!. ............."and deciding to rename the splendid St. James’ Park the Sports Direct Arena, after Ashley’s own cheap and nasty retail chain." We must remember that the primary source of every single pound of the £270m + Mike Ashley has invested in the club is from "Sports Direct". Sports Direct is a hugely successful business providing millions of customers with goods at realistic affordable prices. You may not like it, the fans may turn their noses up at it; but they still keep turning up at the stores and logging in to the Sports Direct Website. Its all rather hypocritical, don't you think? I shop at Tesco regularly - I wouldn't want my club named after it though. You're point doesn't really make much sense.. I very much doubt that Tesco's would have invested £270m + in the club, without interest or dividend, and thus saving the club from inevitable financial oblivion. The primary source of this £270m + investment was from sales at Sports Direct. is it really too much for the fans to bear to find that the club premises are,temporarily renamed pending finding an alternative sponsor? Perhaps the local fans would prefer a Tesco superstore on the site? Thank you for this clearly written and well researched article. The mistakes and lack of understanding that have dogged Mike Ashley's relations with the fans, should not obscure the point that Mike Ashley saved the club from financial meltdown, and his tenure has been infidelity more positive and productive than the previous incumbents who ran the club into the ground. You have to wonder how much Newcastle lose out on from advertising due to Ashley whoring out Sports Direct at every able opportunity. Also Newcastle is a city. Despite being a city, it's referred to by its inhabitants as "The Town" or in Geordie dialect "The Toon". So in this instance, the article title is correct. "You have to wonder how much Newcastle lose out on from advertising due to Ashley whoring out Sports Direct at every able opportunity." I think Decka Llambias has written a few of these comments. "his tenure has been infidelity more positive and productive than the previous incumbents"
The current incumbent hasn't produced 1% of the results the previous incumbents did on the pitch. As fans we take an interest in the financials, but beating Barcelona in the Champions League is always going to be a bigger positive than a £4m operating loss. When Ashley can marry this financial performance with that success on the field you might be able to say he genuinely deserves it. That was 15 years ago, it's been a rocky road since then. It's not as if we were threatening to get back in the Champion's League before Ashley came along is it? And if he hadn't leant the money to the club who's to say where we would be now? When did the custom start that any remark about football beginning "As fans we ..." should be profoundly stupid? And why is it confined to England? it will be interesting to see if anyone wants to pay for the renaming of the stadium. Wasn't the Sport Direct naming a test and a way to prove it works. It isnt a catchy name and everyone I know still calls in St James park. To be honest, from a marketing perspective, it doesn't actually matter what the fans call it. What matters is that they call it Sports Direct Arena on TV - that's the value in stadium naming deals. As usual an excellent article Mr Swiss. I really admire Mike for the good stuff he's done but as soon as he does something good and we start to appreciate him he comes out with humdingers to make the fans not trust him anymore. Fair enough calling the stadium that other name, but what about the fact that months before he plastered the stands and the roof with his signs, the training ground, even all inside the tunnel! Then he tries to say it's to demonstrate to a brand what it would look like. I think a decent international brand could imagine their name on a stadium Mikey! If he came out and said something like I'll have the advertising to pay off some of the debt owed to him I think fans would understand. I think it's a little more subtle than that - it's a glorified version of the "Your Advertisement Here" thing billboard companies do when they have an available slot. He's not telling companies what their brands will look like - he's telling them the space is available. Isn't the whole point that MA bought the club as an eventual veichle for the promotion of sports direct as a business. Could you please look at why serie A is no longer the league it was in the 80's and 90's. BRILLIANT READ. who am i to pick up on the odd grammatical error. 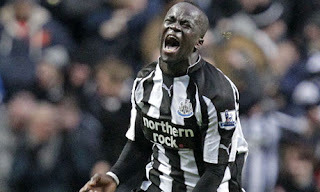 tiote came from holland but i got the gist of it. absolutely superb piece. Great article. Well worth the read. Freezing ticket prices for 10 years might seem like a very fan friendly gesture, but doesn't it betray a lack of ambition? If the owner and chairman are confident we will be riding high over the next decade why sell the tickets off cheap? I can only conclude that Premiership survival is the limit of expectations and this season has been an unexpected one off. Thanks again Swiss for such a well judged and informative piece. You've done it again, Sir, telling it like it is. On a small point of tone I disagree that the massive losses and wage bills you refer to were the fault of our new, previously reviled owner - I'm quite sure he inherited the vast bulk of the enormously bloated payments for superannuated has-beens from previous (mis-)management. His policy is transparent and utterly dependent on the staggeroing success Graham Carr has had in bringing in players at a fraction of their true market value (though he can't claim credit for Andy Carroll and the INCREDIBLE KRUL). £35m !! Don't play poker with Mike Ashley, King Kenny or anybody!I can't beleive even Carr can continue to do his job so much better than his competitors, as alluded to by your excellent self, but as things stand, things couldn't stand better. HWTL! A lot of the bloated wages can be attributed to Ashley's early tenure when Allardyce was manager(eg Smith, Barton, Nolan, Cacapa, Rozenthal, Viduka). Not to mention the disasterous mis-management through hiring & firing of various "managers", and dubious signings to earn favour with foreign agents (Xisco & Gonzalez). Ashley may be getting it right now but he's had five years of mistakes to look back on to realise what not to do. Given the clear success of the Premiership's principles, UEFA should be distributing the TV money from Champions league downwards to Europa League and beyond. Clear, concise, in depth analysis as per usual. Exactly what some have thought/known all along, all in one place. A plan takes time to come together & just because some didn't/don't recognize it, it doesn't mean it ain't happening. People do tend to criticize what they don't understand though. Really very, very good. Many thanks for the article - it's a real gem. One point - it's worth bearing in mind that these figures are for last season, the first after promotion. It's pretty reasonable to assume that revenues will be higher this season (although the article does cover the limitations there are likely to be on how far those revenues can be expected to grow). Also the comparable figures for Spurs (the next team up in the turnover league) include a great big chunk of Champions League money which won't be there in next year's figures. So we're likely to be sitting a very great deal closer to Spurs, and perhaps a bit closer to some of the other 'magic circle' clubs when the next set of figures come out. i) I'm impressed that they've already signed Ba's replacement. He should be fully fit for the EPL by August. ii) Is someone who sacked the successful Hughton to appoint Pardew ready to sack the successful Pardew to appoint Rodgers? The Carroll money could probably buy him and his key midfielders. swiss man. i am quite reguler at your blog. 2. i have read some where that uefa indls are meeting some where to close the loop holes on financial fair play. i would love to see your professional veiw on this along with implementation of this on clubs like city inter chelsea and others. You can subscribe to the RSS feed if you want to be notified when he updates the blog. Yes, I'm busy elsewhere (job, family, life). If you want to read about my views on "clubs like city inter chelsea and others", may I suggest looking at the list of clubs that I have already reviewed? Bit surprised that you don't already know that if you're "quite reguler" at the blog. what i wanted to ask that after the loop holes closed by uefa are they able too fully curb the notion that big clubs with heavy losses will stil participate in the champions league some how?? "'uefa indls are meeting some where to close the loop holes on financial fair play. i would love to see your professional veiw on this along with implementation of this on clubs like city inter chelsea and others." sorry for poor english as it is not my native language. Mike Ashley is a shrewd businessman. You do not amass a fortune like his, without having some nous. Football makes the incredibly savvy, act incredible stupidly. There is this need, particularly in England, to connect and have heart. 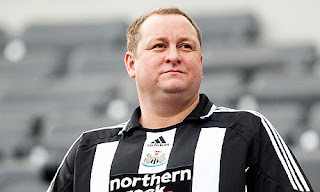 At the end of the day, Mike Ashley has found most success by putting emotion away and doing what he does best. Building a credible business (to sell off, I am sure!). COuld you look at the impact of relegation on clubs is ther leagues. Is it as severe as the EPL? for example, what is the financial hit on clubs like Parma, Hertha Berlin, Majorca if they are relegated from the top division. Do these clubs continue to spend like crazy to get into the top clubs? Just an idea..still waiting on an article as to why Serie A collapsed financially circa 2000/01. And should it serve as a warning to the EPL. On a Guardian blog on Sunday some one asked, what is a Geordie? Another blogger replied that it's someone with a stubbly chin, hairy legs and a lot of jewellery, and that's only the women. Small point: Tiote was bought from FC Twente in Holland and not France as inferred in the article. Sorry you are wrong on the Town issue. Fan do not call Newcastle a town, they call the football club 'TOON'. reason being that St James Park is slap back in the City Centre which is slang for town I'll give you that, but its the shopping centre thats referred to as 'town' or 'Toon' not Newcastle itself. Not so, as a child (40 yrs ago) a trip to Newcastle was usually referred to as 'going through to the toon/town. I'm fairly sure I used to go for a night out ower the toon when I was living there, and that had nothing to do with the football club. The Toon Army nonsense in reference to the club started in the euphoric days of Keegan. I'm a huge fan of anyone who disproves received wisdom so well done Sir! "Three clubs (Liverpool, Sunderland and Birmingham City) have still to publish their accounts for 2010/11, but there is no chance of them emulating Newcastle’s performance." Didn't Newcastle fans make a concious decision during some of Ashley's earlier blunders to support the team, i.e. go to the matches and cheer the players, but not the commercial activity, i.e. merchandising, food outlets drinks etc. This is certainly the case with fans I know and may be part of the reason for the club's relative weakness in these areas. Truly a fantastic article. As a NUFC fan, I must say I wasn't happy with Ashley, but saw that he had saved the club financially. I think he made a lot of mistakes but has learnt from the majority of them. I think someone buying the naming rights and taking it to something with the name St James' Park in could work (and look much better than the current name). You do not get to be worth £1.6 billion by being a mug in business. I'm glad we are not going the same way Rangers, Leeds, Portsmouth and others have gone, and this season we have played great football, that's excited the fans and put us in a great position. Not bad who in the past few years has been: a joke, relegated without a fight, played very direct football, tipped to go down again. Can you say something about this? I don't speak spanish but it's interesting. By the way, FC Barcelona's trasurer said they have 50 millons plus money of sales to spend this summer. If they are that bad how is that possible? It is interesting because since Sandro Rossell is president he is saying the club is financially bad because of Laporta, but this is seen in Spain as a lie, only to put Laporta in a bad position. Some good points but I find it perplexing that our commercial revenues are still so poor considering the Fatman's alleged ability to turn dead or at least lame duck businesses around ? I also wonder why there was no press coverage of the amounts of money changing hands in the latest two year Puma kit deal considering most clubs like to shout details of their latest commercial branding coups from the rooftops ? 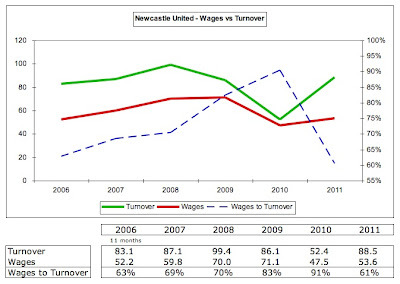 Maybe the money doesnt change hands or not within NUFC at least ? As for the renaming shambles we know, deep down, no one will come forward and put up money for the naming rights. Its just another subtle subterfuge perpetrated by the Fatman. Eventually it will become known as SDA and we'll all have to accept it as we seem to have pretty much done already. I give him credit for stopping the financial rot which was accelerating at an alarming rate under the Robber Baron and his henchmen. However the irony is that after all the money siphoned out of the club by the Halls and Shepherds in salaries, dividends, perks and dodgy deals (warehouses bought and hired out to NUFC, share purchasing with club money etc etc) we are now no better off, financially, under the Fatman than we were with the previous regime. As his loan of some £140m is hanging around the club's neck like the metaphorical albatross. Hats off to the analyst. Really great job! Dear Swiss, please do another in-depth toon article. Pretty please What is MA up to?